I’ve successfully set up over 200 new 501(c)(3) nonprofit organizations, big and small, private foundations and public charities, in just about any issue area you can imagine. I want you to succeed in following your passion. My mission and my role is to make it as easy as possible for you to do your good work. We have an introductory conversation (free consultation) to talk through your vision and dreams. I can answer any questions you have and we can both get a good sense of whether we are a good fit. Even if we aren’t, I’ll give you tips on the process and what to expect. Once we decide to move forward, I’ll send you a contract to review and sign. We’ll have a formal interview where I’ll ask you a series of questions that will give me all the information I need. There may be some follow-up materials for you to send me, such as a description of your programs or other materials that you’ve already created. I’ll prepare articles of incorporation and bylaws that are compliant with state and federal laws; IRS forms and the narrative document; policies and documents to adopt the articles and bylaws; straightforward filing instructions: what to mail/email where. I’ll send you the forms for you to review, ask about, and edit. I’ll make any updates and send edited documents back to you, along with clear, simple instructions on how and where to file them. You sign and file the forms! 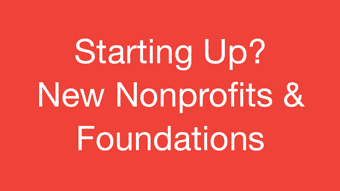 From the time of filing, you can, and should, begin operations as a new nonprofit entity. The IRS will first send an acknowledgement of receipt, and later, your tax-exemption determination letter! Contact me for a free consultation and cost estimate!